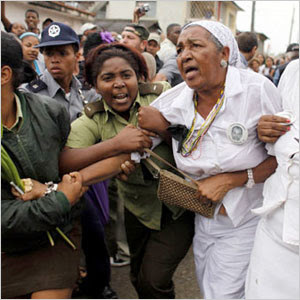 (Via) Yesterday, the Castro dictatorship arrested Reina Luisa Tamayo Danger, an activist grandmother who is also the mother of deceased Cuban hunger strike political prisoner, Orlando Zapata Tamayo. She was arrested along with 39 other dissidents who were accompanying her in a march to Orlando's grave site. Orlando Zapata Tamayo was a bricklayer who died after 85 days in a hunger strike in protest over lack of basic human rights in Cuba. Take note -- 39 dissidents arrested in one afternoon. They all remain unaccounted for. According to Cuban blogger Yoani Sanchez, Sra. Tamayo (that's her being arrested in the photo) has been hurt in the arrest. If you can understand Spanish, click here to listen to an eyewitness describing the beatings and also the jailed women screaming into the night from the local jail as they continued to be beaten inside the prison. It is courageous people like this elderly lady, who will finally bring change to Cuba and eliminate the brutal nightmare that has ruled with an iron fist over that poor island since 1959. Update: If you can understand Spanish, click here to hear Sra. Zapata Danger calling Radio Marti to report that they were being attacked. Her cell phone has been subsequently confiscated by the Cuban police. Update: Babalu reports that "Reina's mouth has been busted, her knees are scraped, and her ribs have been injured from the beating she received yesterday." “It was terrible. I could hear Reina from the dungeons cells. She said ‘Down with Fidel, Down with Raúl, Zapata lives!’. El Campello, a small town on Spain's Costa Blanca has caused a storm in international circles by throwing its hat into the ring as a late shock candidate for the 2020 Olympic Games. The local council, known as an ayuntamiento in the local parlance have contacted the International Olympic Committee to officially declare their interest in hosting the games. An ayuntamiento spokesperson, José Luis Ricardo Rodrigo Gonzalez-Zapatero-Sanchez Canatuna, otherwise known as Pepé said yesterday; "We believe that Campello is perfectly suited to be the host city for the 2020 Olympic Games. Spain is the World Champion in virtually every sport known to man, and we feel that now is the time to award The Games to Campello. get back with more details if they are still available for purchase. Red 1 and Friday, December the Eleventh are both available. Prior to quoting you prices, its nice to know how you discovered the images. Several clients find me through sources that I need to thank & recognize. Thanks so much for your response to my query about those creative works. I first heard about your work at an exhibition in AAF Contemporary Art Fair, NY. Anyway , i will like to proceed with the purchase of both pieces . Can you pls confirm the actual size and price of the two pieces so i can know how best to proceed. I will also like to know what inspire you to make the pieces. AAF! While I was absent from this year's festivities, I do plan on representation in Miami this December. If you plan on attending any of the Florida fairs, please let me know. I should be able to get you a ticket to at least one of the events. Red 1 is $1,500 USD. Its 54 x 36", oil on canvas, unframed. Its heavily influenced by Freud's psychoanalytical interpretation of Perrault's "Little Red Riding Hood," in additional to my overarching interests in disguise, and horror. Friday, December the Eleventh is 3,500 USD. Its 34 x 48", white titanium oil on tinted canvas, unframed. Its influenced by Hitchcock's "Psycho." When you reply with a delivery address, I can quote you shipping costs. Good to hear back from you. Yes, i will like to proceed with the purchase of Red 1 . I think it is a lovely work and i hope to give it a good home. I am presently away in London for my twin sister's wedding even though it comes at a time when i was preparing for a big move and also expecting a baby but it means so much to her. I should be back in few days. Meanwhile,i will like you to forward your mailing address and phone number so i can inform my husband still shutling between our home in New Jersey and Jo'burg, SA on where to forward the payment . He has just been transfer to head the IT section of their head Office in Jo'burg. I can also forward your contact info to the local cartage company that will be moving all our house decors so they can get in touch with you to arrange shipping details. They can arrange FedEx pick up of the artwork from your studio. Congratulations on your sister's wedding. Matrimony is an important institution and one that I plan on making correct in my fourth attempt. And congratulations on what I presume to be your husband's promotion! South Africa is a wonderful country, even with the security concerns. William Kentridge is a favorite artist of mine. Unfortunately, I cannot disclose my residential address or my private phone number. To make a long story short - I'm temporarily residing in a half way house in Mid-Atlantic as part of a witness relocation program. I'm typing you for a computer terminal at a public library. I'm restricted to internet communications as my primary source of correspondence. Also a unfortunate (and related) coincidence, I am not legally allowed to have affiliation with FedEx. Making another long story a bit shorter - the agreement is part of a settlement that dealt with an art fraud / theft case I experienced in 2004. Regardless of these situations, they won't bar us from your purchase of Red 1. We just need to take a few particular steps. Trust me, its safer for both of us. 1) Send $1000 USD to an escrow account I have established. I use a secure, and bonded internet service called Paypal. My account is through the following address; wodzianski@rocketmail. This money will serve as both a retainer and deposit. Upon receipt of your $1000, I'll pack and ship the painting via a third party agency to your New Jersey (cheaper) or South African (expensive). 2) Send your preferred mailing address. 3) Your remaining balance, plus cost of shipping will be due upon delivery. Again, Paypal will be our intermediary. While $500 USD will pay the balance of the painting, an additional fee will be added for shipping and handling. I can send you a precise estimate with your delivery address. Apologies for having to take these specific steps, but the US Government, IRS, FBI, and my legal counsel would be pretty upset with me if I did anything less. Thanks in advance for your understanding and I can't wait to list my work as being part of a South African collection! Check out all the events here. The events go from 6-13 Nov.